Because Will Ferrell himself is an inexplicable bundle of comedic joy, we aren’t even going to attempt to understand or explain why he’s taken his Old Milwaukee ad campaign from Davenport, Iowa to Stockholm, Sweden. The Swedes like beer and comedy, right? So why not. But we’re really happy he did it because the results are, as per usual, hilarious. To follow up his commercials in Iowa, Terra Haute, Ind. 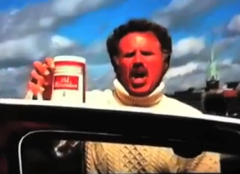 and Milwaukee itself, Ferrell headed across the pond to dish out some Old Milwaukee love as only he knows how. It is definitely all right, Will. After all, he’s the one who approached Old Milwaukee about doing this spots in the first place, so might as well make them awesome, right? *Thanks for the tip, Luke!